Not a recent work but a very good example of micro-site. The site is about innovative camera Samsung NX10. This is a real multimedia adventure – multiple layers, richness, animation. The site has a lot of usefull information, technical characteristics of the camera, features, tests and examples of photography. And yet this site stands out because of it's simplicity and smooth navigation. interactive selection of accessorices, browsing and downloading – easy access to all technical details you need in one click. 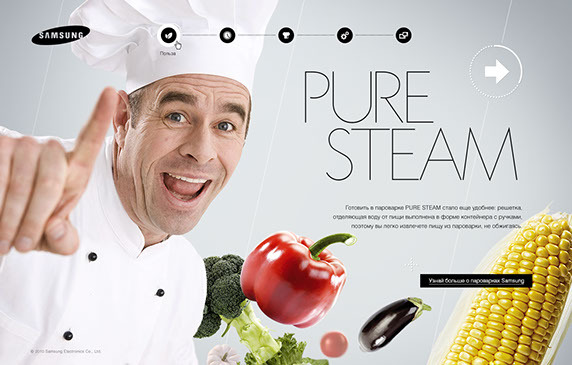 Promo-site for the microwave ovens with the steam cooking function. The goal is to give some words about the functions, explain the advantages of steam cooking an show the variety of models. This site is about healthy eating recepies, nutritionist advices and steam cookers.